The largest nerve of the body. Each of the two sciatic nerves is formed by four or five nerves branching off the spinal cord and running down the back of each leg. 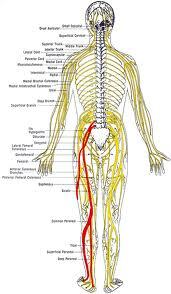 Sciatica is a severe pain in the leg caused from compression or irritation of the sciatic nerve. Sciatic pain usually starts in the buttocks and extends down the rear of the thigh and lower leg to the sole of the foot and along the outer side of the lower leg to the top of the foot. Pain may also be present in the lower back. Several nerve roots leave the spinal cord and exit through holes in the sacrum to combine and form the sciatic nerve, which then passes between layers of the buttock muscles into the deep muscles of the back of the thigh. Another cause of sciatica is the Piriformis syndrome. The piriformis muscle extends from the side of the sacrum to the top of the thigh bone at the hip joint, passing over the sciatic nerve in route. When a short or tight piriformis is stretched, it can compress and irritate the sciatic nerve. Because the piriformis muscle acts to rotate the leg outward, people who habitually stand with their toes turned out often develop Piriformis syndrome, as do runners and cyclists, who over use and under stretch the piriformis muscle. While sciatica can be very painful, it is rare that permanent sciatic nerve damage (tissue damage) will result but it can. While relatively rare, two sciatica-related symptoms that warrant prompt medical attention and possibly emergency surgery, include: progressive weakness in the leg, and either bladder or bowel incontinence or dysfunction. Patients with either of these symptoms may have cauda equina syndrome and should seek immediate medical attention. A highly recognized device that has been shown to provide back pain relief for symptoms associated with herniated disc, bulging or protruding intervertebral discs and degenerative disc disease is called the DRX9000 True Non-surgical Spinal Decompression System™. This particular form of therapy is both non-invasive and non-surgical. Through the application of spinal decompressive forces to compressive and degenerative injuries of the spine, the DRX9000™ has given patients relief from painful symptoms and has allowed them to resume a healthy normal life. Active Release Technique has revealed that Back Pain and Sciatica is more often caused by peripheral nerve entrapments rather than by nerve route entrapments at the Foramen and Disc. We will also show you exercises and stretches for you to do. Set up a consultation below to discuss how I can help you with your leg pain. Get the treatment that you deserve at BackAndHealth. An intriguing concept this. I’m a single of those people whom tend to wait for things to mature prior to taking action but in this case I am mindful that inaction leads to only failures so I will heed your comments and begin to do anything about it.